Buy More, Save More right now at U.S. Crabtree & Evelyn stores or U.S. Crabtree & Evelyn online. Take $10 off your purchase of $50 or more. 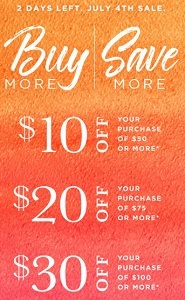 Take $30 off your purchase of $100 or more. No coupon or code needed to receive the offer. Offer is valid until July 4, 2017. More details available at any U.S. Crabtree & Evelyn store or U.S. Crabtree & Evelyn online.